Sporting a highly effective noise­cancelling microphone and support for high­fidelity audio, the stylish binaural Jabra UC VOICE 750 USB headset is also optimized for use with Microsoft Lync and Microsoft Office Communicator. Featuring plug­and­play connectivity as well as seamless integration with Microsoft's VoIP telephony software, the Jabra UC VOICE 750 is quick and easy to deploy with all leading VoIP and unified communication telephony environments. This version also features a stylish dark finish. Excellent sound quality is afforded by digital signal processing technology, while the binaural design makes it suitable for use in noisy call centres. The headset comes with in­line controls and an adjustable headband and microphone arm. 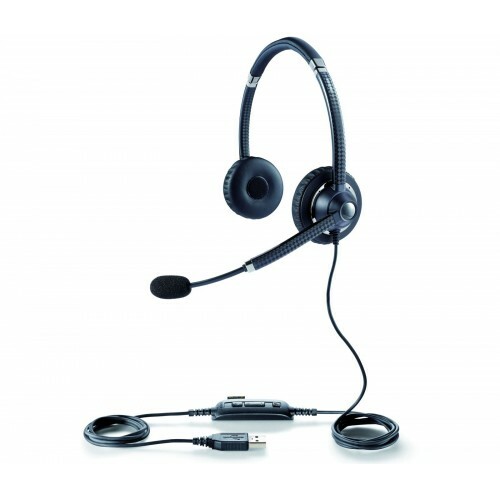 Suitable for use with all of the leading unified communications systems, this headset is best for call centres which use VoIP telephony software from Microsoft.